PLC controlled hydraulic valves which allow for faster lift, smoother start and stop, easier feathering of the controls, and adjustability of the lift and travel functions. The PLC controlled hydraulics allow for much smoother operation of the HHA shortening the training cycle of operators and extending the life of hydraulic components. Hydra-Handler MAX can be set at slower speeds during initial start-up and faster speeds after operators become more comfortable with the equipment. The Maintenance Sensor Package helps ensure that downtime for the Hydra Handler is scheduled rather than emergency. With sensors monitoring key operational characteristics unscheduled downtime is avoided since early warning is given when an out of tolerance situation occurs. Service can then be planned for when requirements for changing batteries are minimal or non-existent. Hydraulic pressure and temperature, drive chain tension, vacuum pressure, and lift bed level are continuously monitored to against prescribed tolerances. When an out of tolerance alarm is active the touch screen monitor utilizes embedded photos and text to describe the failure mode and the method for adjusting the machine to within specification. This option also includes an on-screen preventative maintenance schedule detailing prescribed tasks for the Hydra Handler and a checklist for daily safety inspections. Having this information on-board makes it easier for service personnel to properly maintain the Hydra Handler to factory specification. A component identification module is also accessible from the touch screen monitor. Photos identifying various Hydra Handler components and their part numbers simplify the process of replacement ordering of parts. This is a speedy alternative to the hard copy manual also supplied with the Hydra Handler. This option takes operator skill out of the process by automatically positioning the Hydra Handler at every step of the battery change-out process. Skill levels of forklift drivers tasked to change their own batteries vary greatly. As such, wear and tear on a key piece of equipment can be high. This option allows for safe, efficient, and timely transfer of batteries without extensive training or skill requirements. The integrated touch screen monitor leads the operator through each step ofthe battery change-out process. 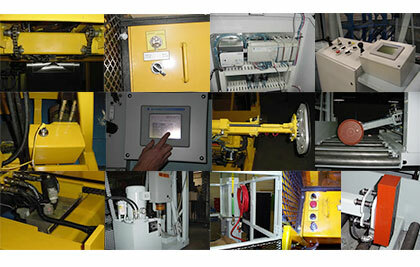 Dead-man switches on the machine ensure that the operator is safe throughout the process. SICK laser personnel sensors also protect against the machine contacting personnel or equipment that inadvertently move into the travel area of the Hydra Handler. When the forklift operator arrives to change a battery he positions his truck to a predetermined location, unplugs the battery, and lifts the battery stop in preparation for the change-out. He then boards the Hydra Handler engaging the man–aboard switch on the platform and closes the gate to the operator compartment. When both of these safety interlocks are engaged the touch screen monitor prompts the operator to choose the truck type he requires a battery for. The First In, First Out utility recognizes which battery is required and with the operator safely holding both pistol grip dead-man switches the machine positions itself to extract the dead battery from the truck. After doing so the Hydra Handler positions itself so the operator can disconnect the new battery from its charger. Next the machine extracts the new battery from the rack, repositions itself to move the dead battery into the now open charging slot, move the battery into the slot and reposition itself for the operator to connect the dead battery to the charger. It then puts the new battery in the truck and moves itself into a resting position so the operator can de-board, connect the new battery to the truck, install the battery stop and return to work. At every step of the process the operator is prompted to perform tasks such as connect or disconnect the battery. Dead man switch controls ensure operator safety during the change-out process by not allowing operation of the Hydra Handler unless properly activated. This option increases the efficiency of the change-out process because the operator can move the extractor arm out of the way earlier. Powered Rollers are used to move batteries on and off the battery changer when the extractor arm can no longer be used. This option increases the number of powered rollers in each battery compartment of the Hydra Handler increases from four to six. The additional powered rollers being outer most of the battery compartment allow the extractor arm to be moved out of the way earlier. On board tank, pump and filler gun allow for watering batteries in the charging stands. This option is used in conjunction with single point watering systems. This Hydra-Handler mounted system makes the labor intensive battery watering process much more efficient by allowing the batteries to remain in the charging stands during watering vs. the standard practice of removing, watering, and replacing. Centered, under-compartment lasers allow Hydra-Handler operators to speed up battery changes by pointing to the proper height on charging stands and lift truck battery compartments. The height Limit Switch option will stop the Hydra Handler from lifting higher than a preset dimension. This option allows for a Hydra Handler to reach the upper most level of battery storage but stops it before going higher. This option would be appropriate for applications where overhead obstructions could be a problem. It has the potential to allow another level of battery charging compared to a unit without this option. An appropriate application would be a room with low ceilings but room to stack chargers behind the racks rather than on a catwalk. This lowers the step to the operator’s compartment from 12” to 7” making it easier for operators to step onto the machine for changing batteries. This option is a must for single sided systems to protect against accidental discharge of a battery on the open side above a preset dimension. The preset dimension is set an inch or two above the highest “R” dimension of the trucks being used in the battery charging system. Utilizing a cam and follower system the flip ups engage as the Hydra Handler is lifted above the preset height. With the flip ups engaged a battery will be stopped if the roller deck is used to move it towards the open side of the rack system. For 2 sided systems with unequal rack coverage a flip up system can be engineered specific to the customers needs at a higher cost for the customization. The roller deck lock utilizes the sensors in each battery compartment (2 on each side of the HHA) to stop the roller deck in order to protect against accidental discharge of a battery. When the roller deck moves a battery into the plane of the compartment sensors the roller deck is “locked” and the safety light flashes. To “unlock” the roller deck, the operator releases the powered roller lever and re-engages the power rollers. The operator must release and re-engage repeatedly approximately every 2 seconds until the battery is fully discharged from the Hydra-Handler. Therefore the operator must consciously decide to continue moving the battery in the direction it was going prior to the roller deck locking. This safety option reduces the possibility of accidentally discharging a battery on the wrong side of a system. Flashing, rotating amber strobe light added to either front or rear of HHA that provides visual indication of HHA operation. This option is available with or without an audible alarm. These safety detection systems will sound an alarm and/of shut power off to the Hydra Handler if personnel or equipment inadvertently enter the travel area when Hydra Handler is powered. One can be positioned at each end of the Hydra Handler. These are already incorporated in the Semi-Automated Positioning option. Provides a method for the operator is lower the HHA in case of power outage when unit is raised. This option allows vacuum cup of extractor arm to attach to batteries shorter than 11” high. This option is typically required when access to AGV batteries is required. This option reduces the overall length of the Hydra-Handler and is typically used when available system length is at a premium. While reducing the length, the single compartment Hydra-Handler requires an empty charging stand accept spent battery before charged battery can be loaded that increases battery change out times.